Thomas Jefferson has a presence in PPPC as a reference to American democracy, freedom, and the separation of church and state. His character is a complex one; much of his outward politics was sharply contrasted by his personal actions. Jefferson has long been revered as a statesman, a hero of the American struggle for independence, and a renaissance man whose varied interests included philosophy, architecture, and science as well as political and social theory. Such scholars as James H. Hutson and Robert M. O’Neil continue to study Jefferson’s views on the “wall of separation” between church and state in an effort to shed light on modern controversies surrounding the issue. 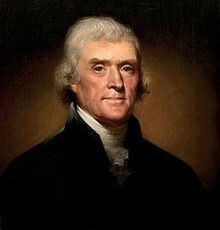 However, on the whole, Jefferson’s reputation has suffered a series of setbacks in the past thirty years. Discrepancies between his idealistic rhetoric and his less-exalted practices, which hardly went unnoticed in his own time, have come to dominate the critical discourse surrounding Jefferson today. His phrase “all men are created equal” is seen as inconsistent with his beliefs about specific groups. According to Charles A. Miller, while Jefferson felt all humans were morally equal, he believed that blacks, Native Americans, and women were not culturally, physically, or intellectually equal to white males. The fact that he owned slaves himself while professing a deep abhorrence of the institution is equally troubling to modern day scholars. As Peter Onuf puts it: “For many present-day commentators, Jefferson’s failure to address the problem of slavery generally and the situation of his own human chattel in particular is in itself the most damning possible commentary on his iconic standing as ‘apostle of freedom.’” And finally, the controversy over Jefferson’s relationship with his slave Sally Hemings, rumored in his own time, resurfaced in the 1970s with the publication of Fawn Brodie’s Thomas Jefferson: An Intimate History. Brodie took seriously the claims by Hemings’ descendents that Jefferson carried on a long affair with Hemings, fathered several of her children, and then held those children as his slaves. Jefferson admirers, such as John Chester Miller, acknowledged the allegations, but dismissed them as inconsistent with Jefferson’s nature and character. Miller, writing in 1977, a few years after Brodie’s book was published, claimed that if the story were true, it would be “in utter defiance of the testimony he bore over the course of a long lifetime of the primacy of the moral sense and his loathing of racial mixture.” Miller also believed that Jefferson’s record as a loving father would have precluded his failure to acknowledge his slave children—if, in fact, they were his. For Miller, if the charges are true, Jefferson “deserves to be regarded as one of the most profligate liars and consummate hypocrites ever to occupy the presidency.” Miller believed that Hemings’ children resembled Jefferson physically because they were fathered by one of Jefferson’s two nephews who were frequent guests at Monticello. Source: Nineteenth-Century Literary Criticism, ©2002 Gale Cengage. All Rights Reserved.